The information presented on this page was originally released on May 5, 2005. It may not be outdated, but please search our site for more current information. If you plan to quote or reference this information in a publication, please check with the Extension specialist or author before proceeding. Ask gardeners why they start growing roses, and you'll get a range of answers that usually fall into a couple of categories. Many will say that they began a rose garden because the queen of flowers provides such beauty, while others love the fragrance. This year, gardeners who choose All-America Rose Selections winners for their garden will discover another wonderful quality of roses: their generosity. The 2003 winners provide an ongoing parade of dazzling color and new blooms, plus some never-before-seen colors and combinations. For example, the two floribunda winners, Eureka and Hot Cocoa, are bushy plants that produce explosions of color throughout the growing season. 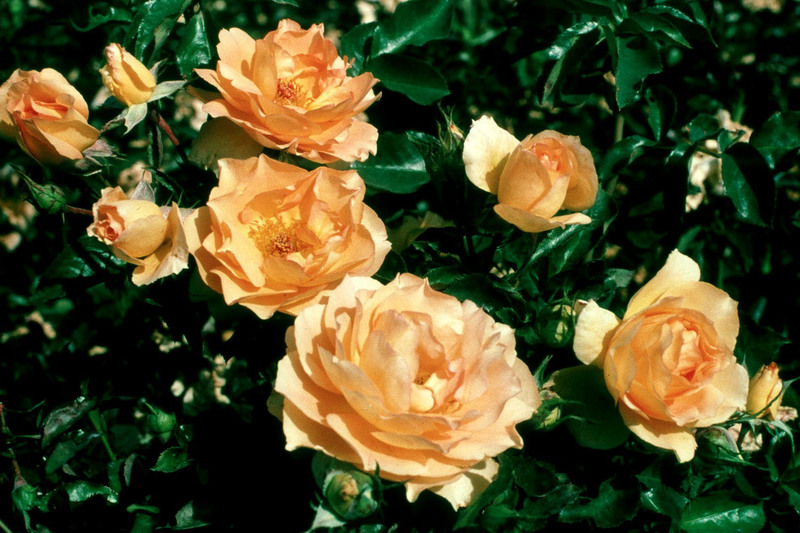 Nearly as wide as it is tall, the 3 1/2-foot-tall Eureka features big flowers in an unusual gold shade that some call copper apricot. The clusters are widely spaced, which makes this rose a wonderful anchor for a corner in your garden. Hot Cocoa, another showy floribunda, is a real showstopper. Gardeners will find their neighbors visiting quite often to watch this unusual chocolate-brown, bicolor rose become the focal point of the garden. If you are looking for a stunning rose in front of your house or to provide a powerful accent when used in combination with pastel flowering plants, get Hot Cocoa at your local garden center. Cherry Parfait, a flashy grandiflora with white petals edged in red, is the second bicolor, AARS winner this year. This winner also always seems to be in bloom, making it the perfect starter for someone growing roses for the first time. Like the other 2003 AARS winners, Cherry Parfait works well as the centerpiece of a garden because of its unusual color combination. These AARS winners not only provide the gardeners with constant color, but with plants that are easy to maintain. Whisper, the only hybrid tea winner this year, stands in utter contrast to the vivid color of the other three roses selected this year. Its creamy white blooms are a breath of fresh air in any garden. Whisper has classic bud form and dark-green foliage to serve as a dramatic background for this classic rose. Whisper works well as an entry plant because it is very showy with a bevy of blooms. 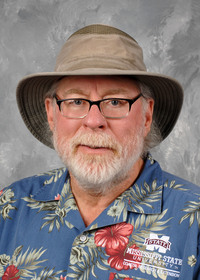 With excellent repeat characteristics, this AARS winner will bloom well into the fall season. Plant your roses where they are easy for you to watch and enjoy. A convenient location also will help you notice any insect or disease problems. Water with soaker-hoses instead of overhead sprinklers to greatly enhance your success. 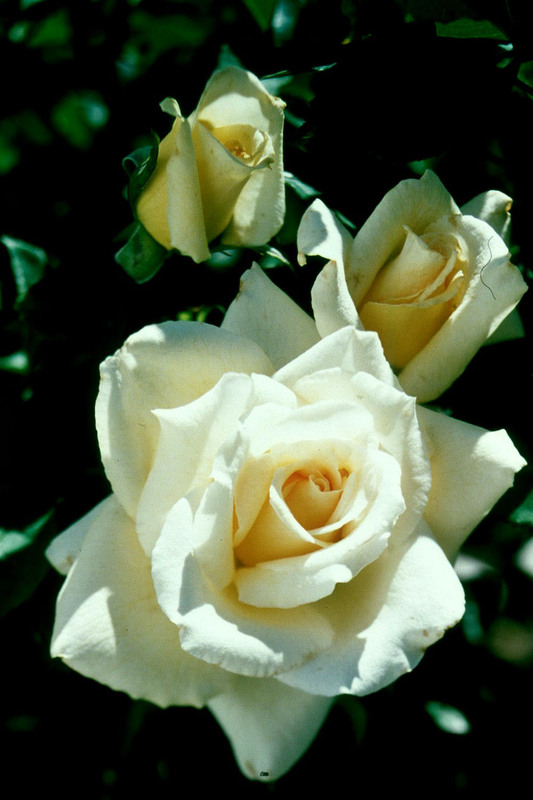 Feed your roses every four to six weeks with light applications of a slow-released fertilizer. My favorite is a 12-6-6 with minor nutrients; others like those with a 1-2-1 ratio. Gardeners, whether beginners or veterans, will find Eureka, Hot Cocoa, Cherry Parfait and Whisper disease resistant, and a good bet for any garden.